It’s week 3 of a new training cycle. I took a lot of time off after Boston to recover mentally and physically (more mentally than physically). It didn’t take long for the fire to start burning, though. Within a matter of weeks a race schedule for the remainder of the year fell into place and I started to get excited about running again, slowly by surely. I have more energy when I’m in a training cycle, at least if we leave out the long Saturday afternoon naps (if I’m so lucky.) It’s nice to have something to look forward to. I set some goals for 2013 that sounded super scary on January 1st (with Coach Hadley‘s help). I rarely set a goal race time at the beginning of a training cycle. I want the race to come to me. I don’t want the pressure of the time on the clock to ruin my training. I want to keep pushing and see what happens. The closer I get to the start line, the more comfortable I become with a goal time. At that point, I know what I’m capable of and, if all goes well, that number will be there waiting for me at the finish line. Plus, there’s always the secondary goal to be happy about. This year was the first time I actually typed out mid-term and long-term time goals. It seemed so silly–to let the dreamer in me out. I kept my goals to myself. When I ran Chicago 2011, my goal was to finish and have fun. When I ran Twin Cities 2012, my goal was under 3:20. A few weeks before the race, 3:18 seemed possible. I ran a 3:17. At Boston 2013, my goal was 3:12-3:14 but I wanted more than that. I wanted to experience the race that I’d waiting 2 years to run. I knew I could PR after a strong cycle, but I honestly would have been happy just to do so by 1 second. It was enough just to be there. I ran a 3:14. If you asked me in January if I’d be running a fall marathon, my answer was “no”. I thought I would want to take some time off. With the Twin Cities and Boston cycles so close to one another, it just seemed like the fall would be a good time to rest and recharge. But here I am again! 3 marathons within one year, with a total of 18 months of training. I’m gearing up for races and thinking about the times I want to see on the finish clock for each distance, from 5k to the marathon. 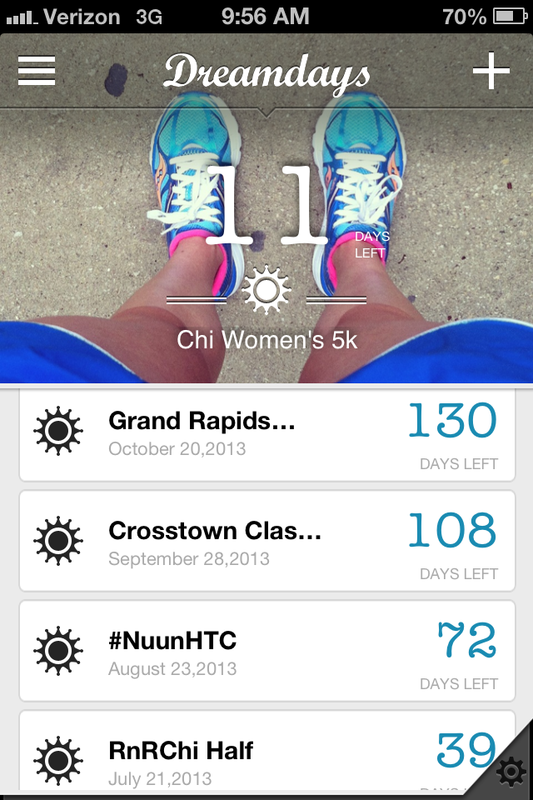 I put my race schedule in a Countdown app this morning and gasped at how little time there remains until my races. 72 Days until Hood to Coast with Nuun?! Insanity! Dreams are scary but I guess it’s time to buck up, work hard, and celebrate when they come true. Good luck with the training cycle. I like your philosophy of not letting a time clock ruin your training. I set up a goal race pace early on and tend to get injured trying to run too many fast miles too early. Slow and steady build is my new mantra (hopefully). Not sure how I missed adding your blog to my feed, but I did now. First thing I thought of after reading the goals was – Go Big or Go Home! Stay healthy and enjoy the training! That’s one exciting late Summer/Fall racing schedule. Looking real good! Thanks Leslie! The app is Dreamdays. A lot of the other countdown apps are kind of clunky. Glad I found this one! Ha! I have been pretty quiet lately so don’t beat yourself up too much about it, girl! 🙂 I’m really excited about the schedule, especially with so many different distances and PRs to run.